IT’S TIME!! IT’S TIME!! 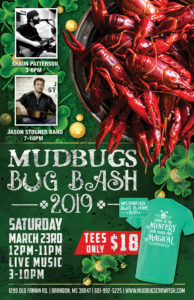 Time for our annual Mudbug Bash!! Y’all make sure to join us March 23rd, 12pm to 11pm, for your favorite Crawfish, Beer & Live Music!! We will have Shaun Patterson playing 3pm-6pm and the Jason Stogner Band playing 7pm-10pm! !